The Sharp Focus is the new face of Boise Hawks coverage. Get thoughts and news from every aspect of the game, without ever having to leave your seat. What a surreal season it’s been. It’s difficult for me to NOT wax poetic as I talk about the changes as a writer and sports journalist over the past few months. I’ve covered a lot of losses, as the Hawks finished under .500. I’ve covered some unbelievable wins too, and have encountered some people that won’t soon be forgotten by me. I’ve decided to separate it into two blogs. This one…about the players that have gone. Special thanks to Onalee Carson for tracking down this info and pictures for me. Nine position players and eight pitchers have come and gone as the season has progressed. I’ll try not to focus too much on those players released or sent down, especially early. But players like Matthew Cerda, who was batting .174 when he got hurt but was the first fan-favorite of the season. At least, that’s how it sounded when he came to bat. The fans seemed to embrace him long before many of the other players. Jose Valdez was one of my favorite players to watch before he got called up. His speed was something to write home about. Or on here…and I did plenty. Jordan Petraitis started with the Hawks, and was one of the many MAC connections on the squad before his departure. I’ve heard he has stayed connected with the Boise team in more ways than just facebook and occasional viewings of the BoiseHawks.COM website. Then there’s the big one. Brett Jackson was here for a short time, but I was lucky enough to get to cover him on my road trip to Eugene. There is a lot of class on the Boise Hawks, and he’s hardly an exception. He was good for a hearty laugh, or at least a smile every game I worked at Memorial Stadium. When it comes to pitchers, there was the hurt Su-Min Jung that went back to college in Korea, and Josh Whitlock who got the call up just recently. Joe Simokaitis was an “aged” perspective on the team, and helped players like Greg Rohan with batting, even though he had made the change over to pitching. Mike Perconte was a stunning talent too, at times. I remember a pit in my stomach when he got called up, because I knew his spot from the bullpen wasn’t going to be easy to replace. But the one that stood out to me most was Jeff Antigua. This guy was stellar, with a 2.30 ERA while he was here, and baffled the batters unlucky enough to face him. He and fellow-departed pitcher Tarlandus Mitchell were the only pitchers I sat in awe of. Antigua for his over-all capabilities, and Mitchell for his accent and 98-mph fastball. It’s hardly a complete list, but the Boise Hawks that took the field for their final game were much different than those that struggled to the 3-12 start. There was more than just bats and gloves that took the field, there were personalities this season. I’m glad I got to know at least PART of them. I tip my hat to the struggles of the team. And with one last seventh-inning stretch, I’ll remove my hat to Franky Font as well. His ability to lead a struggling team in the beginning for Casey Kopitzke should not be forgotten. I’ll try to keep you all posted on the progress of these guys as we move forward. I had to make sure to grab Casey after the game last night and talk to him about the fact that the Hawks are playing better than they have all season. Of course that’s an arguable point, and Casey is not the type that will just accept pure conjecture or opinion like that. But I doubt he’d be able to deny the noticeable difference in demeanor of ANY manager after a team has won four of five, or five of six, and a manager that is coming off a rough road trip. It’s a “development” league, as I’ve said so many times this season. But with the way the team has put it together since the losses of their top pitcher and hitting prospect, it seems as though the team has a real interest in winning. “We’re not out of it yet,” was all Casey said about that. “Out of it” implied the division race, and the fact that the Hawks are 7.5 games out of first place doesn’t seem to fazed a manager that hasn’t seemed fazed by much at all this season. The team is fired up, and playing some of its best baseball against some of the toughest opponents in the Northwest League. Even after I tossed a perfect strike (arguable), the Hawks were able to upstage such an event by winning in exciting fashion, pushing runs across when they needed them, and sending the staffers home to nurse the wounds that come during a long season. Just ask Rohan, who is starting to look like Craig Biggio. If I’ve learned anything from Kopitzke, it’s that he’s going to take this season series by series. And, after taking four of five from Everett, the team is poised to attempt to take the second of two against Spokane. If they need me, I’ll be warming up my arm. That title will ONLY be used once. Don’t expect me to ever say something even similar. I thought it tasted so good I actually glowed, as evidenced by the photo. Not bad, above average gourmet ballpark fare…I thought that the meat was solid, better than the meat they had in Yakima, but Yakima had better veggies and a much better roll. Would I pay $7.50 for it? No…especially not on Family Feast Night. Where would it rank in the league? Definitely below the Teriyaki Bowl in Spokane (which I am looking forward to on the next road swing), the Bread Bowl in Everett, the Boomer Dog in Yakima, and the Chicken and Chips in Vancouver. I like the Super Nachos and the Chicken Wrap (without tomatoes) better in Boise. But – it is very good. 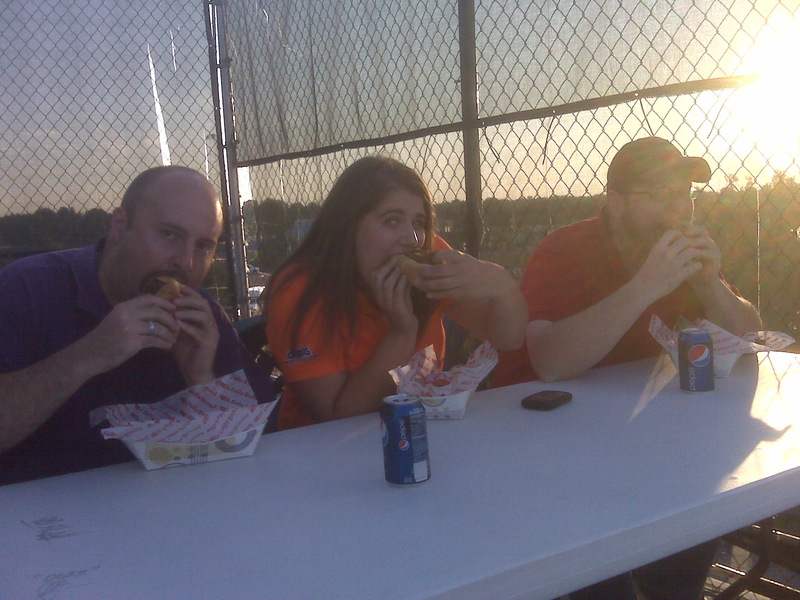 I hadn’t exactly realized I would be a part of last night’s food critique and had already had quite a bit to eat before they brought the philly up, however I didn’t want to be the only HAM member not finish the sandwich. I powered through it and enjoyed pretty much every second of it. I’m a huge fan of philies, and this one is one of my favorites. 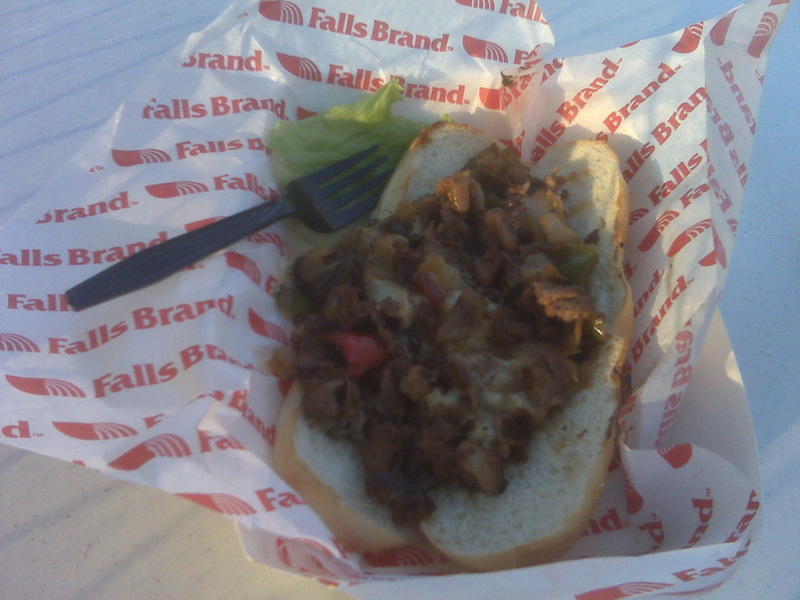 But I would cut back on the onions a little bit; they seemed to overpower the sandwich both in taste and consistency. I’m not quite sure what kind of cheese is used on the philly but I think it is delicious and it seems to meld all of the contents and flavors together. I don’t know if we toast our buns, but the bread on the philly was just the right consistency–soft in the middle but kind of toasty on the edges…perfect for a heavy-loaded sandwich. The sandwich is definitely a big one so make sure you are going in on an empty stomach. After I had failed so miserably at finishing what I was given on the first day, I knew I had to go into this one with a full head of steam. I was fully prepared and ready for the sandwich, and it went down like a champ. ONE problem with the cheesesteak, and that’s a problem I have with EVERY one I’ve ever had. I don’t like green or red peppers. But, I dealt with it. Why? Because I’m a self-sacrificing man. The meat was well done, and I could have used more of it. Maybe Onalee was right about having fewer onions, but an onion-obsessed HAM member would have argued the opposite point. The cheese definitely made it worth while, and while the roll wasn’t the best, it was high class stuff for a ballpark sandwich. I give it TWO HAMS out of four. I sat there, looking at my “Super Nachos” last night and felt powerless to finish them. They were passed to me, Chris Langrill from the Idaho Statesman and Will Love from the Idaho Press Tribune. I’ll give you what they had to say, followed by my own thoughts. At $8, it’s not a bad value, because you probably don’t want to try to eat these super nachos by yourself. In fact, you probably will want help from more than one friend. Plenty of “layers,” so you can pick and choose your ingredients as you scoop. You can go after olives, onions, beans, ground beef, jalapenos, sour cream, salsa and melted cheee. The salsa has a little kick, and the jalapenos allow you to adjust the temperature to your liking. The chips held up well, compared to some that turn into limp, soggy relics after seeing a few nacho toppings. Word to the wise: Bring your friends and eat them quickly. They tend to turn into a gooey mess after a while. But, then again, I don’t think the inventor of nachos worried too much about their appearance after a half hour. Finally, there’s the cheese. What can I say? Sometimes you just crave liquid cheese that came from a can and nothing else will do. Other times, not so much. I like to melt Velveeta with a can of Rotel, so I’m not against the whole concept, but I’ve learned that, alas, my stomach is not usually on board. 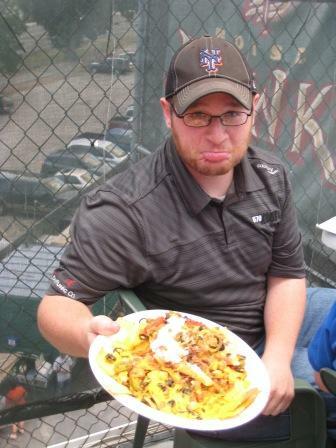 This is the first time I have had the Super Nachos at Memorial Stadium. Up in the pressbox, I always see fans packing this enourmous dish back up to their seats and wanted to give them a try. I think Mike Sharp put it best when he said, “I worry about the person who can eat the whole thing.” With that said, the Super Nacho presented a perfect option for a couple or family attending a game. It is reasonably priced and probably portioned right for two adults or three or four children. The impressive thing about the nachos is it gives you options when you take a bite. Maybe on one chip, you will find refried beans, olives and some salsa. On another, you may get some taco meet, onions and cheese. The thing is packed! I think everyone should try the Super Nachos at least once in their lifetime. My suggestion, though, is get plenty of exercise before you do try, because it is a mouthful! I have to agree with the guys. It’s probably the best bargain I’ve seen from the stadium, and if you have children, and/or a small community, this would be perfect for you. The nature of nachos allows for small portions among a heap of food. I’m not going to lie, I fell far shy of finishing, but OH did I enjoy the attempt. I’m not a big Velveeta fan, but the beans and meat made up for it, and I enjoyed having the olives on there as well. I made the comment to Will Love that it’s a beer drinker’s dream. After two Banquet Beers, I’m going to be digging into that stack like it’s nothing. And it would be, when I finished. But as a sober man, you see how I did. BOISE, ID – Peter Jackson knew pretty early that his little boy, Brett Jackson, was going to be something special. Brett’s effect on his peers’ parents only grew, yet he never let what others said go to his head. But he was ahead of every other kid. And a baseball man he became. Jackson grew up on the outside of the “in” group of athletes. And he used his lack of complete acceptance to continue to drive himself. He played shortstop in high school and decided to try to go to his dad’s alma mater Cal. It didn’t take long for Esquer to catch on to the special abilities of Jackson. Jackson had to work on his body through his career at Cal. And he was able to put himself in a position of being told he might go early in the Major League Baseball draft. Now, that humble athlete is working his way up in the Cubs system and he saw plenty of success in a Boise Hawks uniform. It would be easy for his parents to believe he can go as far as he needs to, and they do. But they keep their son in check. But his coach wastes no time talking about the potential of Brett Jackson. What began as a little boy with a little bat has grown into a man with professional abilities. But ask his father, his coach, or Jackson himself, and the credit goes to the mother and father that taught him that success went beyond the baseball field. Success is measured by those you love. I took the time over the past few days to NOT write anything down. It was a conscious choice, and involved me showing up to the final two games of the homestand without a notepad in my hand, and with a mind set on attempting to enjoy what I was doing more than just do it for work. I got the chance to see a baseball game for fun for the first time in a long time, and I definitely owe everyone involved a gracious thank you. But I saw a team that lacks something. I wish I could define what it is. I made the comment to a friend at the game that whatever that “something” is, it’s going to start making a regular appearance in the lineup. Since then, they’ve lost 4 of 5, and three in a row. Even the sturdy Ryan Sontag is experiencing a little bit of a letdown. The question is, will the ship be steadied? There are plenty of new faces on the team, and there’s plenty of talent to win the games, so why has that feat become so difficult? It goes beyond losing your No. 3 hitter. Casey Kopitzke has a lot of pride and confidence in his players, and he’ll defend them tooth and nail, but this can’t be easy for him to watch. Heck, I’m not even on the road this trip, and it’s hard for ME to see. So now I’m going to have to apologize. I made the statement on the air the other day in Eugene that I thought the Hawks had a chance at coming back from the hole they sat in, and would be capable of finishing the year in first place. Apparently, even something as vague as “a chance” is enough to jinx me to a point of humility. Technically, mathematically, they do have a shot. But after Brett Jackson and Jeff Antigua got called up to Peoria, and DJ Lamahieu skipped Boise altogether, it looks unlikely. Casey Kopitzke seemed almost offended at me asking him if there is another guy on the team with Jackson’s capability to bring the squad together. It was Jackson that solidified the unit when he showed up on July 4. It was Jackson that attacked his teammates with shaving cream. And after spending some time in the clubhouse, I could tell the players responded to him. Kopitzke called Jackson “a piece”. As in, a piece of the puzzle. There are a lot of other pieces in the puzzle that have worked hard to get the Hawks back into a position of good baseball. He’s right, it was an unfair question. The guy had “tools” and definitely assisted a team that needed leadership, but Hak-Ju Lee, Jae-Hoon Ha, Logan Watkins, Justin Bour and others are just as capable of batting in a few runs. What I would like to see is Greg Rohan step up into a more vocal role as a leader. The guy has the humility to make a difference, and the skills at the bat. He showed that at Kent State. The thing about puzzles is, it takes every piece to make a good picture, and whatever new pieces show up from Mesa, it may take awhile to force them into the vacancies left by the Cubs 1st round pick. Last night was a little surreal for me. I wish in one blog entry I could explain what being on the road meant to my understanding of the Hawks organization. But during last night’s romping at the hands of Vancouver, I was able to look at the game a lot differently than I had in the past. During the road trip I saw some great baseball. The best baseball I’ve seen from the Hawks all season. I had the chance to talk to the players and sit in the dugout with them as they tried to figure out each step of their young pro baseball careers. And suddenly, a 10-run deficit meant less to me. I talked about how much Gary Van Tol talked to me about development, and I’ve had my share of quotes from Casey Kopitzke about how each series is a different setting, and a different situation. Van Tol even went as far as to say mistakes breed progress. More than that, success breeds success. So…is it possible that a 3-2 series win could go farther for the progression of a team than a simple sweep? If a team experiences no affliction, can it really progress? Wow, I might be waxing too philosophical here. All I know is, the temperature was NOT 105 degrees last night, and it was two pitchers that allowed the runs that lost the game. Let’s hope they learned from their mistakes. It’s good to be home, but I’m the only one that gets that relief. To the Hawks, it’s another series. It may in front of the Boise fans, but it’s not in their backyard, and after one week on the road, I don’t blame anyone for needing a big loss to remind them of how good they are. Sometime after last night’s big victory against the Eugene Emeralds that moved the Hawks to 16-20, and gave them the third win in four games, I sat on the bus headed back to the motel. It hit me: Somewhere I missed a turn. At some point the Hawks went the direction of a confident, proud and fun baseball team. It happened subtly to me because I’ve seen them every day, but I tried to step back and view them from day one. Casey Kopitzke has told me over and over that the team has developed every day since he joined the team. It’s a quote, and I wrote it down. But until yesterday it hadn’t really hit me just how deep the development goes. Gary Van Tol, a coach for the Hawks, talked to me today about how the smallest success can spell progress for a team. That’s one huge asset of me being here. Take last night’s throwing error by Hak-Ju Lee. He had commited so many already, I had begun to call him Hak-Ju “E”. But in the play he commited an error in, he got to a ball an average player would have no chance at. And then he made the wrong decision and threw it. It’s a play he won’t make again. “Now we’ve won,” Van Tol said. Development is so important, that a simple mistake NOT being repeated means progress. And the winning trend for the Hawks has done nothing but speed that process. It’s amazing to me how much one big hit can change so much. I’ve been on this road trip, and there wasn’t a whole lot to write about when it came to what I was seeing from the team. I hadn’t seen much teambuilding. There were pieces here and there. But after Justin Bour pounded a line drive down the third base line on Saturday to give the Hawks a huge 10-9 road win at Eugene, what I saw on the bus was spectacular. First, the players sat in the back like usual, and I could hear the conversations going on. They were definitely more relaxed and had an air of excitement after the game that had just finished moments before. But then things all changed when Mike Safford decided to play his call of the winning hit. The team exploded as they heard those moments, and the ensuing action was almost as good as what had happened on the field. Hak-Ju Lee and Jae-Hoon Ha took turns with the bus microphone and sang some songs a capella. I’m not sure I could have expected “Superstar” to be sang so perfectly by two guys that struggle so mightily with the English language. But at one point pitching coach David Rosario and I caught eyes with the same look of “Wow”. I don’t think anyone could expect the voices on those two guys. Then the players piled off the bus to a dance by Lee and Ha, and a full round of applause from all nearby. I hope to upload some audio and video. In fact, I’m planning on hitting the studios with the “big hits” from the Hawks team. I’m no scientist, but the kind of connection I saw among the players last night HAS to help them as they continue with two more games in the hottest field on the west coast. We’ll see. But if they win another one in the same fashion, I’m requesting something from “Tommy”.